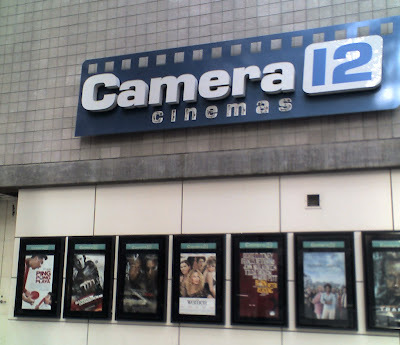 Intrigued by Robert Palgon's review and Long and Barry's recommendation, in the Sunday afternoon, I took the light rail to San Jose downtown Camera 12 to watch the movie "Ping Pong Playa". The train stopped right in front of the theatre. I arrived about 30 minutes ahead of time. No one was in the cinema 4. So I sneaked into cinema one to have a sneak preview of the other movie "I Served the King of England". There were only 5 people watching the movie! Nevertheless, it was a nice movie and I may go back to finish it. 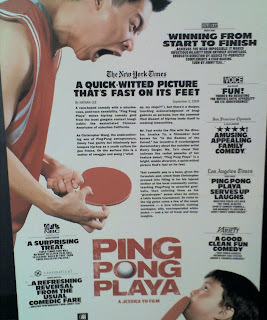 I went back to cinema 4 for the "Ping Pong Playa" expecting an empty hall as well. To my surprise, although it was not a full house, there was a very decent crowd! According to Robert, September 11 should have been the last day for the movie. I guess the box office was not too bad after all. If you expect a movie like "Balls of Fury", you will be disappointed. If you want to watch high level ping pong, you will be disappointed, too. However, the movie is surprising entertaining. I wouldn't tell you too much here to ruin it movie for you. You have to watch it yourself. By the way, in addition to the ping pong players Robert has identified (Barney Reed, Biba Golic, Mas Hashimoto, Diego Schaaf, and Wei Wang), I think I recognized one more - Adam Bobrow. He was also in the "Balls of Fury" but this time he got to say a few lines! on the next page are post videos of the Olympic tournament besides videos around the world as well as the world table tennis.